With an international reputation as one of the most popular brass ensembles today, Canadian Brass has truly earned the distinction of "the world's most famous brass group. Friends Chuck Daellenbach and Gene Watts first came together in 1970 to form a brass quintet - a chamber music setting not entirely new, but never before having garnered the success and storied career Canadian Brass would achieve over the next 40 years. Initially, Gene took on the role of developing new repertoire while Chuck was the moving force in marketing, publishing and managing the business. Three empty chairs were quickly filled and together, the group's imagination and consummate musicianship elevated the art of the brass quintet to what it is today. Here was not only an opportunity to explore the possibilities of an all-brass chamber group but a challenge to bring the sound and the excitement of brass music to new audiences. With a discography of over 130 albums and an extensive world-wide touring schedule, Canadian Brass is an important pioneer in bringing brass music to mass audiences everywhere. They have sold well over 2 million albums worldwide, with 1.2 million sold in the Nielsen Soundscan era alone (since 1991). They continue to score Billboard chart positions - like with their rousing recording of patriotic songs and marches, Stars & Stripes: Canadian Brass Salute America, which spent 8 weeks in the Top 25 on the Billboard Classical Chart, peaking at #2! 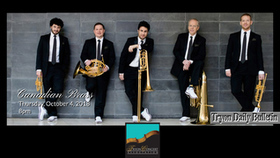 Touring legends with an enthusiastic fan base, the Canadian Brass play to packed houses everywhere throughout the USA, Canada, Japan and Europe. They have also toured Australia, the Middle East, the Soviet Union and South America. They were the first brass ensemble from the West to perform in the People's Republic of China (where they returned for a 5-city tour to great acclaim in the spring of 2010 and several visits after this, including an appearance on Hunan TV for Chinese New Year) as well as the first brass group to take the main stage at the venerable Carnegie Hall. On numerous occasions Canadian Brass has been invited by the Canadian Government to play for visiting heads of states, becoming one of Canada's greatest resources and musical ambassadors. Millions of television viewers have had Canadian Brass in their homes with appearances on The Tonight Show, Today and Entertainment Tonight and recently to more than 1/2 a billion viewers for Chinese New Year on China's most popular station. They have appeared as guest artists on Evening at Pops with John Williams and the Boston Pops, Beverly Sills' Music Around the World, numerous PBS specials, including a celebrated appearance on Sesame Street, and are frequent guests of many major symphony orchestras. Canadian Brass were the featured artists on the soundtrack to the 1988 film The Couch Trip, starring Dan Aykroyd and Walter Matthau. Consummate artists, the quintet has also created unique and interactive videos that have gained an international audience including a series of DVDs featuring the brass in concert and teaching. They are on the cutting edge of technology offering their fans multimedia airplay, downloads and youtube videos and streaming opportunities as well as digital applications with iPhone and other smartphone carriers. You can find them twittering and on Facebook with their fanbase growing daily! 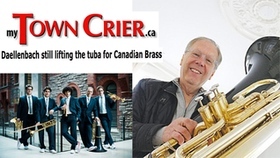 The varied Canadian Brass repertoire features brass standards as well as a wide-ranging library of original arrangements. These include the works of Renaissance and Baroque masters, Classical works, marches, holiday favourites, ragtime, Dixieland, Latin, jazz, big band, Broadway and Christian music as well as popular songs and standards. Having started with a very limited base, Canadian Brass has created their own musical world by transcribing, arranging and commissioning more than 600 works, including critically acclaimed compositions from Michael Kamen, Luther Henderson, Bramwell Tovey, Don Gillis and more. They have transformed a previously neglected group of instruments with a limited repertoire into a versatile and vital ensemble that can play everything from Gabrieli to Gershwin! 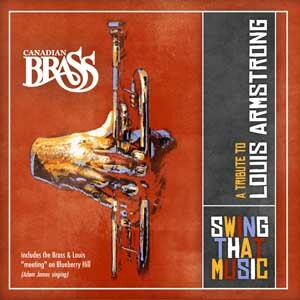 Canadian Brass is especially noted for their famous Holiday Concerts at Christmas time and was at the forefront of re-establishing Scott Joplin with today's audiences through their research, arrangements and recordings of his "rags" and other works. 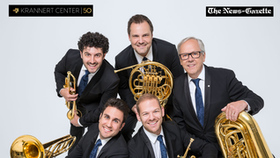 With four decades under their belts, Canadian Brass continues to thrill audiences around the world – and they don't look like they are letting up anytime soon! Celebrate the life and music of American jazz legend Louis Armstrong. Seventeen outstanding arrangements featuring Louis Armstrong's best-loved songs and most recognizable hits including Ain't Misbehavin', Sweet Georgia Brown, St. Louis Blues, Carolina Shout, Black Bottom Stomp, Struttin' With Some Barbecue, Black and Blue and Way Down Yonder in New Orleans. The title track, Swing That Music is a song that Louis Armstrong composed and later, it became the title of his autobiography. Canadian Brass tuba player Chuck Daellenbach is reclining in an easy chair at his Rosedale home, sharing anecdotes about his music career. One tale in particular that stands out involves his role in one of the most iconic photos in Canadian history: former Prime Minister Pierre Trudeau doing a pirouette behind Queen Elizabeth II. READ THE FULL My Town Crier INTERVIEW. Featuring the music of Vince Guaraldi, Luther Henderson and Brandon Ridenour, ‘Christmas Time Is Here' pays tribute to some of the most popular animated specials created for the holidays. Founding member Chuck Daellenbach says of the album: "This recording represents a collaborative artistic venture built around a single vision – to create inspiring music for the holiday season." 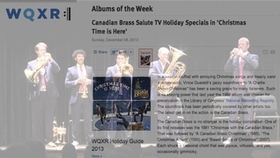 The Canadian Brass: Christmas Time Is Here is WFMT: Chicago 'New Release of the Week. 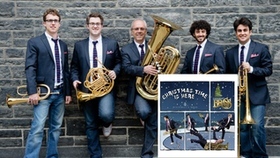 The legendary, mad-cap Canadian Brass, will perform from their new recording: Christmas Time is Here, on New York's 'WQXR Presents from The Green Space.' Hosted by WQXR's Jeff Spurgeon. The new CD features arrangements by Vince Guaraldi and Luther Henderson and includes A Charlie Brown Christmas, The Grinch Who Stole Christmas, Rudolph the Red-Nosed Reindeer, Frosty the Snowman to name a few. In a season stuffed with annoying Christmas songs and treacly carol arrangements, Vince Guaraldi's jazzy soundtrack to "A Charlie Brown Christmas" has been a saving grace for many listeners. Such is its staying power that last year the 1965 album was chosen for preservation in the Library of Congress' National Recording Registry. The soundtrack has been periodically covered by other artists too. 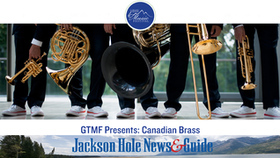 The latest get in on the action is the Canadian Brass. The Canadian Brass is no stranger to the holiday compilation: One of its first releases was the 1981 "Christmas with the Canadian Brass." That was followed by "A Canadian Brass Christmas" (1985), "The Christmas Album" (1990) and "Sweet Songs of Christmas" (2007). Each struck a seasonal chord that was joyous, virtuosic, and yes, occasionally gimmicky. In "Christmastime is Here" the quintet romps through Guaraldi arrangements like "Christmas is Coming," "Skating" and the title track, as well as traditional Christmas songs. It also pays homage to other 60's TV specials with "Rudolph the Red-Nosed Reindeer," "Frosty the Snowman" and Dr. Seuss's "You're a Mean One, Mr. Grinch." The arrangements don't depart too far from the originals but they do show the quintet in fine form throughout. 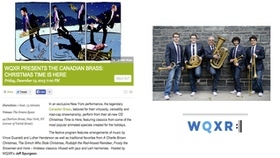 The brass are this week's WQXR: Album of the Week and will perform@The Greene Space in New York on Friday, Dec. 13. The event is sold out but it will be webcast live on WQXR.org. Each week, KDFC: San Francisco members will receive an exclusive link thru KDFC's eNotes newsletter. You can download a free mp3 from some of the biggest releases in the world of Classical music, only at KDFC.com. Featuring the music of Vince Guaraldi, Luther Henderson and Brandon Ridenour, Christmas Time Is Here pays tribute to some of the most popular animated specials created for the holidays. Including many new arrangements, this is the Canadian Brass' second release for the Steinway & Sons label, and is KDFC: San Francisco / Download of the Week for December 2nd, 2013. Growing up in the early fifties in a small community in Northwestern Quebec hundreds of miles from Montreal, Christmas was always a very special time of year. When the big day came around, snow had been on the ground for weeks and was already piling up on the roads and streets. The temperature rarely rose above minus 10 during the day, and when walking, the snow squeaked underfoot it was so cold. Christmas carols were continuously played on the radio (TV had yet to arrive in our town) and so by the time the festive season was over, the words and tunes of the seasonal music had become very familiar. 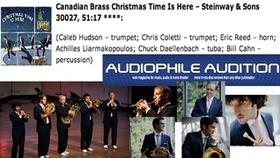 The Canadian Brass has brought back the richness and remembrances of the season with their release Christmas Time Is Here. The Grinch, Rudolph, Frosty and more! Perhaps if the Grinch had just gotten a little taste of what a Canadian Brass Christmas is like, he would have been celebrating with the best of them! The Canadian Brass' forthcoming holiday album Christmas Time Is Here – released on the Steinway & Sons Record label will be available to melt all the icy hearts in the land. Featuring the music of Vince Guaraldi and Luther Henderson, Christmas Time Is Here pays tribute to some of the most popular animated specials created for the holidays. Everyone loves the iconic brass quintet- they've been performing for over 40 years. "Bach's Bells," "Have Yourself A Merry Little Christmas," "Frosty the Snowman," and "O Tannenbaum" all find their place on this spectacular holiday collection. "You're a Mean One, Mr. Grinch" features some masterful playing and singing from the members: this is one of THE most requested holiday pieces that they perform. This collection of holiday favorites was arranged in part by Luther Henderson and former trumpeter for the Brass, Brandon Ridenour. Brandon Ridenour, who performed with the Brass for seven years, arranged the Guaraldi works and incorporated his knowledge of how the Canadian Brass performs best - with a pinch of humor and a heaping of virtuosity. These timeless classics are infused with jazz and lush harmonies, making this album the perfect accompaniment to holiday parties. It won't be hard to delve into the holiday season with this album as the soundtrack. Brass quintets are a staple of the holiday season, but the sheer musical ability that Canadian Brass brings to every piece is unparalleled, and you'll never hear the holiday classics done quite like this. Founding member Chuck Daellenbach says of the album, "This recording represents a collaborative artistic venture built around a single vision: to create inspiring music for the holiday season…This is the best family venture, perfect for the holidays." With a discography of over 100 albums and an extensive worldwide touring schedule, Canadian Brass is an important pioneer in bringing brass music to mass audiences everywhere. Whatever the style, the music is central and performed with utmost dedication, skill and excellence. The hallmark of any Canadian Brass performance is entertainment, spontaneity, virtuosity and, most of all, fun. Millions of television viewers have had Canadian Brass come into their homes with appearances on The Tonight Show, Today and Entertainment Tonight and recently to more than 1/2 a billion viewers for Chinese New Year. They have appeared as guest artists on Evening at Pops with John Williams and the Boston Pops, Beverly Sills' Music Around the World, numerous PBS specials, including a celebrated appearance on Sesame Street, and are frequent guests of many major symphony orchestras. The Canadian Brass plays custom-made gold-plated instruments built by Conn-Selmer. 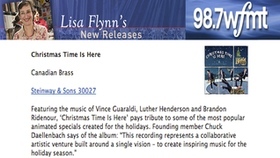 Canadian Brass' Christmas Time Is Here will be released on October 29th, 2013.